Summer is a time for outdoor activities, including days at the beach, camping trips, and barbecuing, but it's also a time for insect populations to grow. For these reasons, it's especially important to be wary of insect stings, even if you haven't had an allergic reaction before. A study published in Annals of Allergy, Asthma, & Immunology, says that half of fatal reactions happen to people who have never been stung before, and that venom immunotherapy (VIT) is the best way to prevent severe reactions. 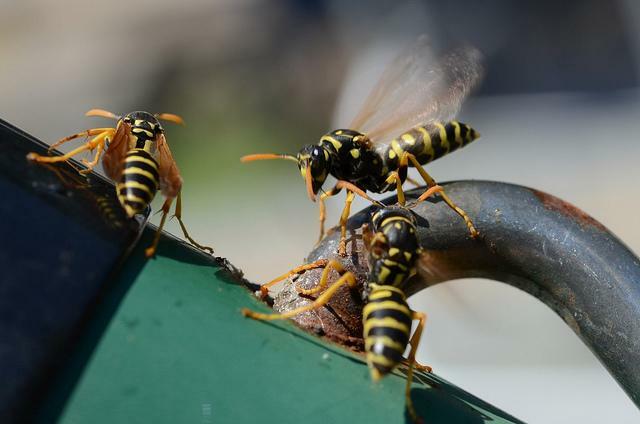 "While it does not always cure insect sting allergy," venom immunotherapy — a form of allergy shots — can almost always prevent severe reaction stings," David Golden, the author of the report and a fellow at the American Academy of Allergy Asthma & Immunology (AAAAI), said. "It usually provides long lasting immunity after the treatment is stopped." The AAAAI estimates that as many as two million Americans are allergic to insect stings. Stings send as more than 500,000 people to the emergency room each year, and as many as 50 people die each year as a result. Golden says that the number of people with allergies to stings is increasing too. Most people who suffer first-time allergic reactions to stings are treated with epinephrine injections in the emergency room. These shots of adrenaline help to relax airways and tighten blood vessels during an allergic reaction. After a patient leaves the emergency room, they're given an EpiPen — an epinephrine autoinjector — that they can use if they are stung again. However, this form of treatment is less optimal than VIT because the patient must carry around the EpiPen everywhere to be effective and, in the case they are stung, must still get to an emergency room before the epinephrine's effects wear off. VIT may be a better treatment for patients who were told they are at a high risk of suffering a severe reaction, Golden said. The treatment works by gradually introducing increasing doses of purified insect venom into a patient's body over the course of three to five years so that their immune system can learn not to overreact. Although it doesn't always cure insect allergies, about 5 to 10 percent of reactions that do occur after VIT are mild, and less than two percent of them are severe, even years after treatment has stopped. Therapy prevents severe reactions, and improves quality of life, since patients don't have to worry about being stung every time they go outside. Fire ants stung Tracey Boeye in the 1990s on three separate occasions, she told Healthline. All three times, she received epinephrine injections. However, her allergic reaction after the third sting caused her throat to close so much she thought she was going to die. It prompted her to visit an allergist and undergo VIT for several years. Since the treatment, she's been reaction free. "It's not always a cure, but it's close," Golden said. Although the Food and Drug Administration (FDA) approved the therapy in 1979, it hasn't been as widely used as epinephrine injections; something Golden says is "so frustrating for us (AAAAI)." Avoid walking barefoot in grass, where stinging insects like to forage. Be wary of drinking from open soda or juice cans. Bees, wasps, and hornets may be attracted to the sweet scent and go inside. Keep food covered while outdoors. Avoid wearing sweet-smelling perfumes, hairsprays, or deodorants. Avoid wearing bright colored clothing with flowery patterns. Source: Golden D. Advances in diagnosis and management of insect sting allergy. Annals of Allergy, Asthma, & Immunology. 2013.